Good news, everyone! Futurama is finally making a comeback to television. And this is not a faux comeback like the dvd movies released in recent years, but a proper 26 episode season comeback, this time on Comedy Central. After 7 long years, Futurama is back! On Thursday night, two brand new episodes will premiere. Fans will be hoping the show is back to its best after the recent films were met with a mixed reaction. Personally I loved the first one, but the three after that seemed terribly lacklustre; a few laughs here or there, one or two classic moments (The "Scary Door" segment in Bender's Game made me laugh harder than I've laughed in a long long time), but overall lacking the quality of the earlier episodes. Some have suggested that what the show simply works best in the classic half hour episode format. Well having seen the first two episodes now, I think I would have to say that the jury is still out. The first of the two episodes, Rebirth, picks up right where the last movie left off, literally. And in many ways it feels like a continuation of the same style that we've seen in the films. The episode deals with questions of sentience and identity, and the issues of replacing a lost loved one, in this case as a robot (basically the exact plot of AI). Sure, there are some funny moments, a few good gags (especially Studio 1^2*2^1*3^3, the Professor's 'traditional medicine', and every moment featuring Zapp Brannigan), but the jokes often feel laboured, and it's just not as subtle or as intelligent as the classic episodes. The running joke in this episode of Bender having to party non stop or else he dies became tedious quickly, and it wasn't funny to begin with either. 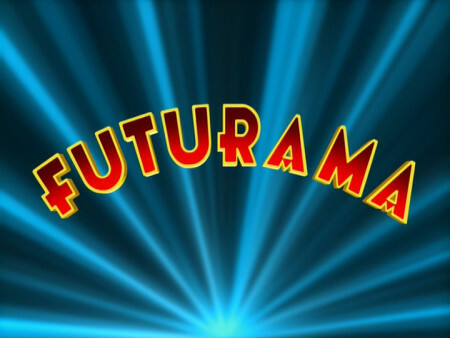 When it was at the height of its powers, Futurama could also produce some good dramatic storytelling (I don't want to meet the man who didn't come close to shedding a tear at the Jurassic Bark episode), and in this regard the movies (with the exception of the first one) felt, and the new episodes still feel, somewhat lacking. The twists in this episode just felt forced, particularly the exposition in the final segment which didn't allow the episode to maintain any sort of effective flow. It's not bad, let's face it there is no such thing as a bad Futurama episode, but from this episode the show is certainly not back to its best. The second episode, In-A-Gadda-Da-Leela, starts off much better, probably due to the increased prominence of Zapp Brannigan. This felt more like old school Futurama, with the jokes coming more frequently, and with much greater success. The cheesy 1950s sci-fi styled sequences which bookend each act are good, and the writers take a particularly glorious snipe at the silliness of CSI. Better. In this episode some kind of death-sphere is on the way to probably destroy Earth. Zapp and Leela go on a mission to defeat it and wind up marooned in a mysterious wilderness. Zapp goes about his business trying to get Leela to sleep with him, and Leela, who is now dating Fry, has to resist temptation. Here the episode starts to fade; Leela is unconvincingly portrayed as a complete idiot, making her far less likeable as a main character, and the funny jokes and references are dialled down, instead making way for some pretty generic gags about tv censorship. The final act in particular is weak and ends the episode badly. All that being said, this episode is definitely an improvement, and the first half suggests that the writers still have a sense of humour, which bodes well for the future of the series. The jury is still very much out on the success of this comeback, but I've seen enough to be optimistic that the show will be back to its best given the time to get back into the swing of things. What's wrong with the England football team?